Grandma and Grandpa's 50th (or 60th!) anniversary, a relative returning home from an overseas deployment, the birth of a first grandchild ... these are just a few reasons to get a family reunion vacation on the calendar. In today's world, many families are far-flung, living across the country and around the globe, with limited opportunities to spend time together. By all meeting at one location for a definite length of time, you will all have a chance to truly BE together with no 'real life' interruptions! 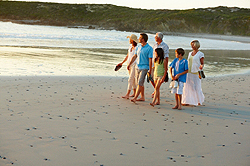 Why not consider an all-inclusive resort, or a cruise, or a multi-generational guided tour? Let The Travel Gallery provide you with options to meet your individual needs and budget and you will come home with memories to last a lifetime. Our Preferred Suppliers! Book Online! Need to find properties for a family of 5 or more to the Caribbean or Mexico? Click Here.